California regulators ordered two Orthodox Jewish groups in Los Angeles to stop performing the Yom Kippur ritual Kapparot on Friday, CBS News reports. Two operations in the Pico-Robertson area in West Los Angeles were ordered by the California Department of Food and Agriculture to shut down the traditional Jewish ritual in which a chicken is swung overhead and then its throat is slit. Sephardic Orthodox outreach group Bait Aaron and Ohel Moshe, a synagogue, were performing Kapparot, which is practiced by a small group of Orthodox Jews on the eve of Yom Kippur, the Jewish Day of Atonement. They were accused of operating unlicensed slaughterhouses, according to CBS. However, the report states that the agency will work with the groups to obtain proper permits. Animal rights advocates had protested the act in the days before the closure orders. Kapparot involves swinging a live chicken over one's head three times and reciting a prayer to cast sins to the bird. Activists state that it is primitive and barbaric to believe that an animal's suffering can atone for a human's sins. Additionally, their claims of horrific animal cruelty are getting attention and support not only from the public, but also from some rabbis. Last week, the recently elected Ashkenazi chief rabbi of Israel, David Lau, warned Kapparot organizers that the failure to treat animals decently is a violation of religious law, reports the Jerusalem Times. 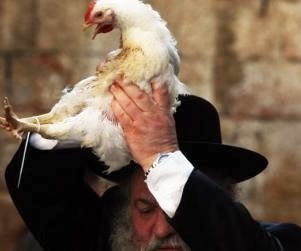 A number of other prominent rabbis have expressed concern that the ritual, in which chickens are hauled into dense urban centers by the truckload, makes it virtually impossible to adhere to the Jewish principle of "tzaar baalei chayim," which prohibits inflicting suffering on animals." CAN ANIMAL CRUELTY BE JUSTIFIED IN THE NAME OF RELIGION? During this ritualistic animal sacrifice, cages crammed with chickens are stacked on top of each other—often in grueling sun. Photos taken by the NY Daily News in Hasidic neighborhoods last week revealed chickens in stacked crates on the sidewalks, sometimes for hours or even days before the Day of Atonement, which begins Friday evening this year. "Thousands of chickens — condemned to die in a Jewish redemption ritual — instead died in Wednesday's unseasonable heat in Brooklyn, according to the NY Daily News report by Tanay Warerkar and Oren Yanv. The poultry which was to be slaughtered in Kapparot died in cramped cages when temperatures hit the mid-90's. "We lost about 2,000 chickens because of the heat," said a man who works in Skwere Mosdos, a Borough Park shul. Machzikai Hadas on 43rd St., was charging $8.50 per chicken. According to another report the price could be as high as $30 each. Critics of the practice have long called it illegal animal cruelty that's not mandated in the Torah or Talmud. Rina Deych, 57, a Brooklyn nurse and a member of the Alliance to End Chickens as Kaporos, states regarding the chickens dying in the heat, "I am horrified, I am upset, but I am not surprised." During her passionate fight for the past 20 years against use of chickens in the Yom Kippur ritual of kapparot, Dyech, who is not Orthodox, was treated like she was crazy," reports the Jerusalem Times. She was told things had always been this way and if she kept up the battle, she would only incite anti-Semitism. Today she is joined by a growing number of rabbis who advocate the use of coins instead of chickens. "Every year I'd see little kids tell their parents, 'The bird is crying!,' and the parents would say 'No, it's singing. It's happy to help us," she recalled. "I'd come over and tell them the kid is right." Contradicting parents in front of their children did not make her popular, but it did earn her the title of "the crazy chicken lady." "You have to be a little bit crazy to do this," she admits, "but I do it for the same reasons I became a nurse. I can't stand to see a living creature suffer without trying to help. I feel it's my duty." Adam Frank, a rabbi for the conservative synagogue in Jerusalem and an activist with the animal rights organization, Hakol Chai, says that there is an extra level of mistreatment in the Kapparot ceremony - with animals brought into communities, crammed in small cages, and sometimes left for days with no food or water. The rabbi also questions the religious value of the tradition. "Judaism takes seriously the idea that we have to do the hard work, the painful, emotional toil of finding out what we did wrong in the past year and repairing it with people." Giving people an out by transferring sins onto something else, he says, is misleading and defeats the whole purpose. KFI Radio's John & Ken show in Los Angeles on Friday, September 13, discussed the Kapparot ritual taking place in the Pico-Robertson area of the 5th Council District represented by Councilman Paul Koretz. An activist who called the program stated that the city had been asked to stop the slaughter which was taking place in a public location and where the squawking of the chickens while in the cages and as they were being killed was heard in the surrounding area and viewed by children. She said that members of Koretz' staff had been contacted at his nearby office on Robertson Blvd. and they stated they were doing all they could. Koretz chairs the Personnel and Animal Welfare Committee of the City Council. It is not indicated whether the response by the Food and Agriculture Department was due to a request by the Council office. The caller said that the chickens were being sold for $18 each and she refuted the claim that they were being donated to several local food banks and a mission that had been named as receiving the dead birds for food for the poor. She said she had been informed by those organizations that they could not accept animals killed in this manner. She also stated that bags of dead chickens were seen being loaded into trash bins. RITUAL ANIMAL SACRIFICE IS LEGAL BUT IS IT NECESSARY? With respect to freedom of religion and religious use of animals within secular law and those religious acts themselves, as Kapparot, the U.S. Supreme Court decision in the case of the Church of Lukumi Babalu Aye v. City of Hialeah in 1993 upheld the right of Santeria adherents to practice ritual animal sacrifice, stating in the decision, "religious beliefs need not be acceptable, logical, consistent or comprehensible to others in order to merit First Amendment protection." "The main part of the service is handing the chicken to the slaughterer and watching the chicken being slaughtered," Rabbi Shea Hecht, head of the Chabad-affiliated National Committee for the Furtherance of Jewish Education and the organizer of a major kapparot site in Brooklyn, said in a recent NPR interview. "Because that is where you have an emotional moment, where you say, 'Oops, you know what? That could have been me.'" Rabbi Adam Frank states that, while some ultra-Orthodox communities cannot be dissuaded from performing the ceremony, he would suggest that it at least be kept away from the public eye. "This issue today is one that brings desecration of Judaism and God's name more so than ever before, not because the practice is any different, but because people are more aware of it." Rabbi Frank said. "This issue has become one that's in the public eye, and if it's an issue that reduces people's respect to Jews and Judaism, and it is not one that is mandated by Jewish law, which Kapparot isn't, then it is something that needs to really go to the side of history and be reevaluated."